I’ve been in the middle of a reading drought lately. Every time I pick something up, I fall asleep on my husband’s shoulder, or get distracted by whatever’s on the stove, or start running to-do lists in my head. I’m hoping it’s just baby brain. One of the few exceptions this year was Dinner: A Love Story, by Jenny Rosenstrach. Part memoir, part cookbook, Dinner: A Love Story is a treatise on how to make sit-down family dinner as consistent as dinner itself. Now that I’m pregnant, I think about family dinner a lot. Will we find time in our busy schedules to enjoy a home-cooked meal? How will I ease my daughter into new flavors and textures? Will I be able to balance prioritizing nutrients and health with teaching her the joys of indulgence? Clearly I’ve got a while to think about these things, but when my husband ate his first bite of this Lamejun and said, “we could totally convince our kids this is pizza,” I got pretty excited. This recipe was adapted from Ana Sortun’s marvelous cookbook, Spice. Check out other cookbook suggestions from M & D in our Mother’s Day post. Note: Don’t spend too much time cutting the vegetables with precision – it’s all getting ground into a paste anyway. 1. Preheat oven to 375 degrees farenheit. 2. 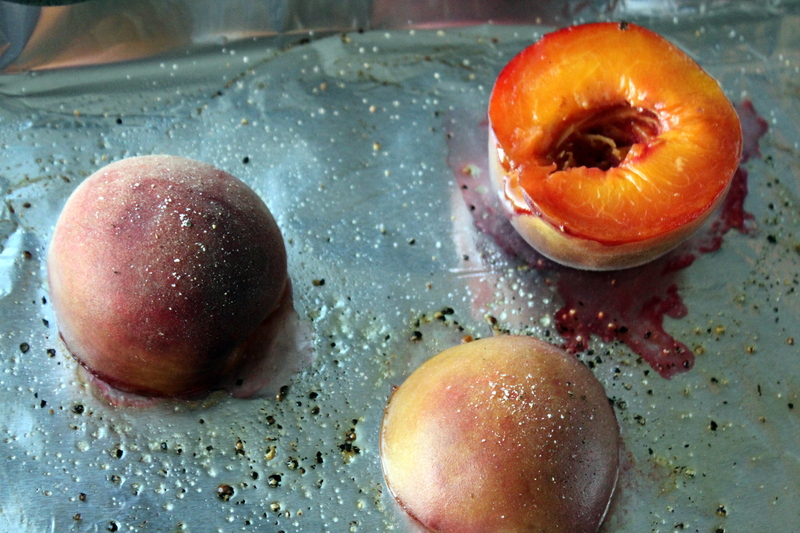 Drizzle olive oil onto a heavy baking sheet and place the peaches on the sheet cut side down. Sprinkle with salt and pepper. Roast the peaches in the oven for 12 minutes or until they are just soft and tender when poked with a knife. Take them out and set aside. 3. While the peaches are cooking, grind the chicken to a paste in a food processor until it comes together in a ball and becomes smooth and thick, about 1 minute. Make sure that the chicken gets smooth enough or it will break up when it cooks. 4. Add the onion, scallions, red pepper, sumac, za’atar, salt, and egg white to the chicken, and pulse until thoroughly mixed into a single paste. (I pulsed a few times, then held down the button for 15-30 seconds so it would fully grind everything together). 5. Place chicken mixture in a small mixing bowl, and stir in the cream and pistachios. 6. 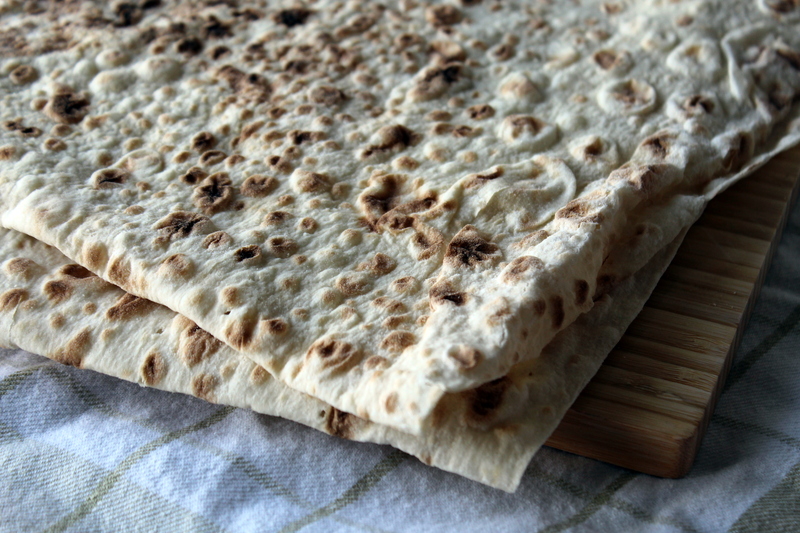 Cut lavash into 3 equal pieces, so you have 5×6 or 5×7 inch rectangles. 7. Spread chicken mixture onto lavash as thinly as possible and as close to each corner as possible so the mixture coats the bread in an even layer. If the mixture sticks to the spatula, dip the spatula into a little water or olive oil and continue spreading. 8. Place the lamejuns on a heavy baking sheet or pizza stone and bake them for about 12 minutes or until they are crisp and the chicken mixture is cooked through. You may need to do this in batches, since this makes a large portion of lamejun. 9. While the lamejun a baking, peel the skin off the peaches with a paring knife (if cooked and tender, the skin should pull right off). Cut each peach half in 6 slices and set aside. 10. To serve, top each lamejun with 2 slices of peach and preferred garnish and serve hot. 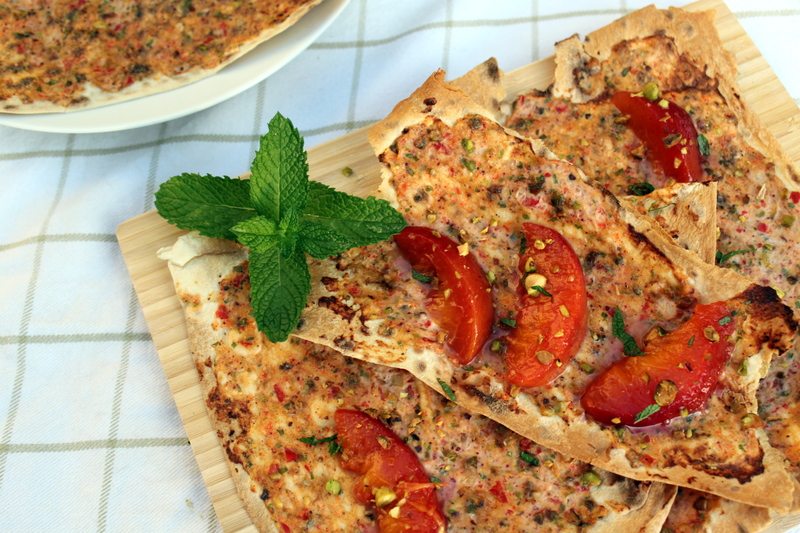 This entry was posted on July 25, 2013 by mezzeanddolce in Appetizers/Dips, Breads, Mezze, Poultry and tagged chicken, peach, pistachio, sortun, sumac, zaatar.